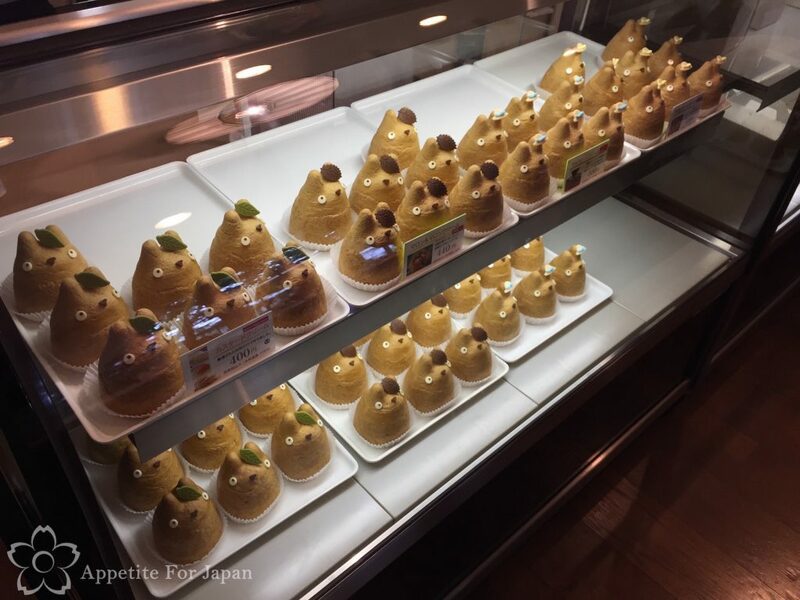 Aside from the Totoro themed cream puffs, Shiro-Hige’s Cream Puff Factory has another Studio Ghibli connection. 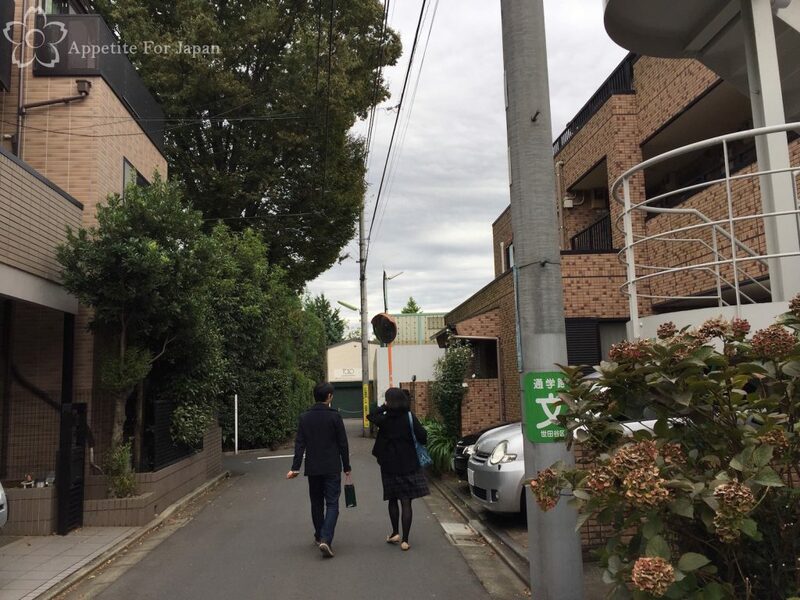 It is said that the owner of Shiro-Hige’s Cream Puff Factory is the sister-in-law of Hayao Miyazaki, founder of Studio Ghibli. 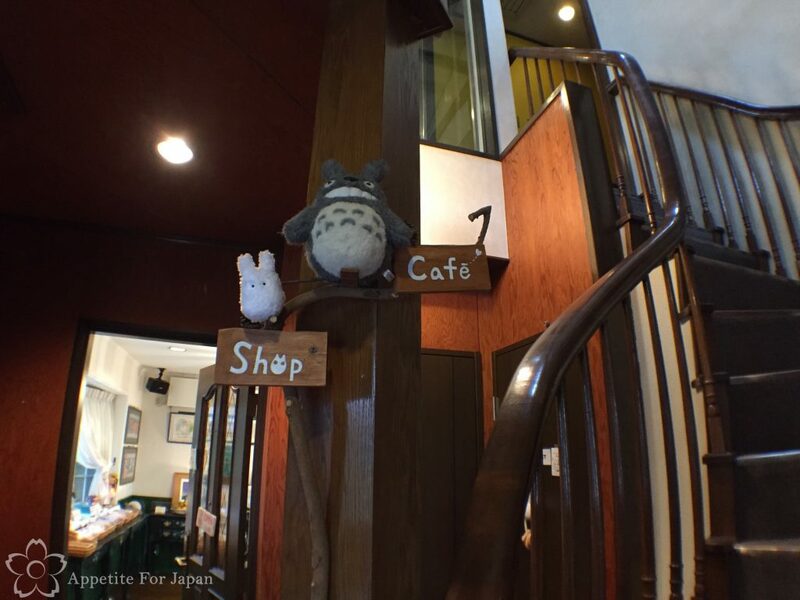 This is currently the only place that you’ll find ‘official’ Totoro cream puffs, and it doesn’t have the usual trappings of a Japanese theme cafe; no ‘service charge’ on top of your order, no silly rules, no over-priced meals or huge queues to get in. Just nice profiteroles inspired by Studio Ghibli’s Totoro, and other light meals and desserts. Shiro-Hige’s Cream Puff Factory (or as the sign in the above photo says, Shirohige’s Cream Puff Shop) is actually separate to the cafe. 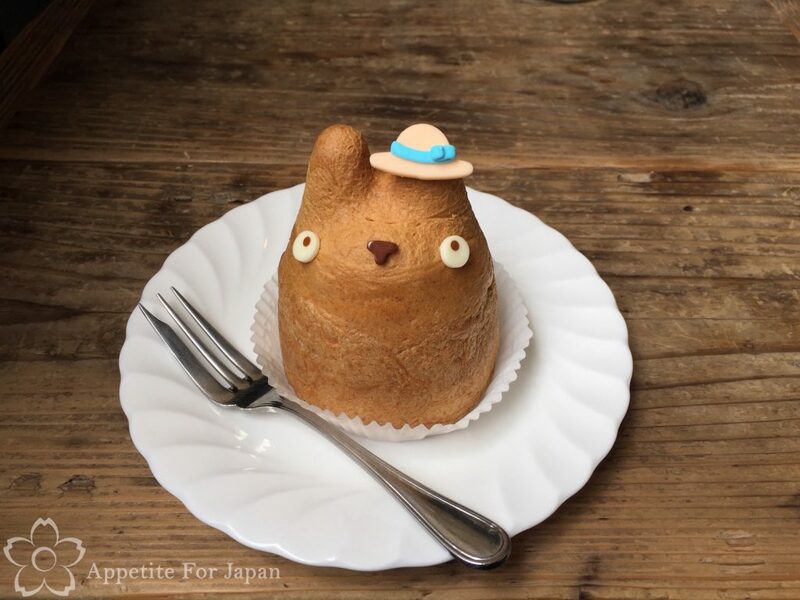 The Totoro cream puffs are made downstairs and sold as take-away (take-out, for my American readers) there. 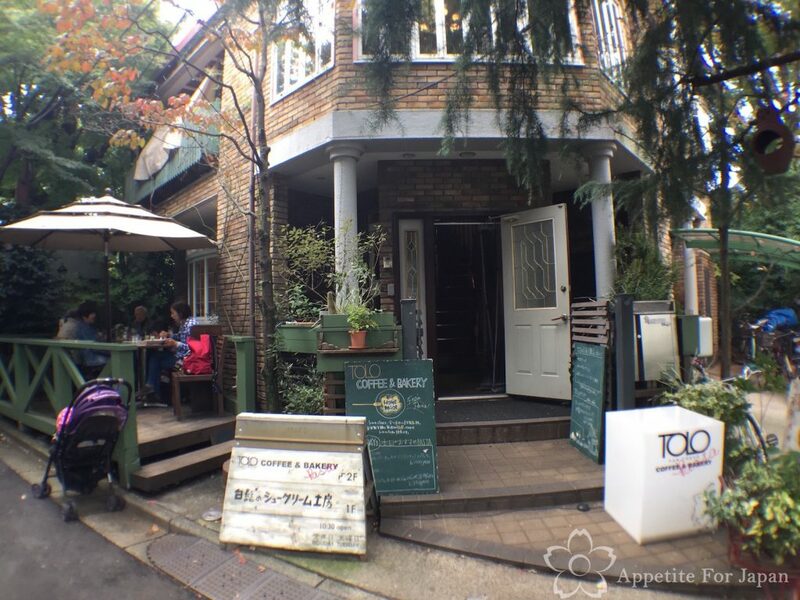 If you want to eat in, you’ll order and sit at the Tolo Pan Tokyo Coffee & Bakery Cafe upstairs. 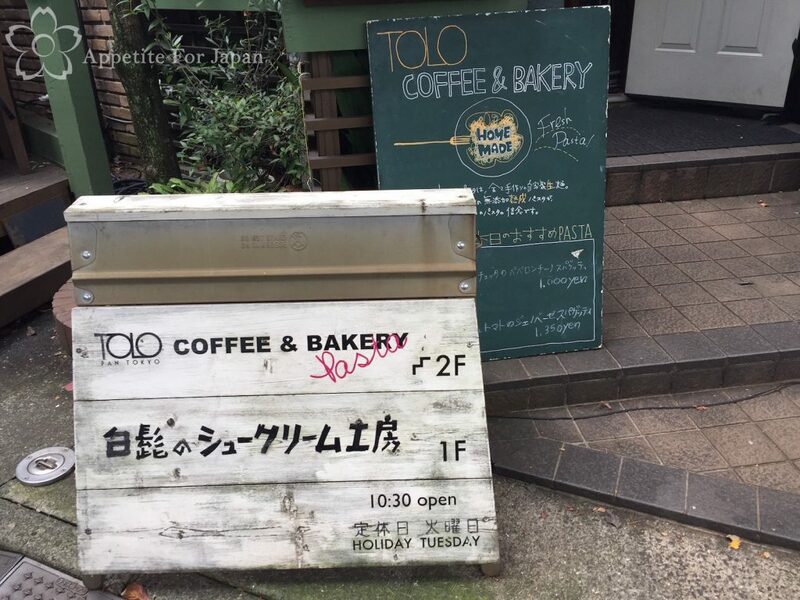 In addition to the famous Totoro cream puffs, Tolo Cafe also sells meals such as pasta, a couple of other desserts, along with drinks such as tea and coffee. 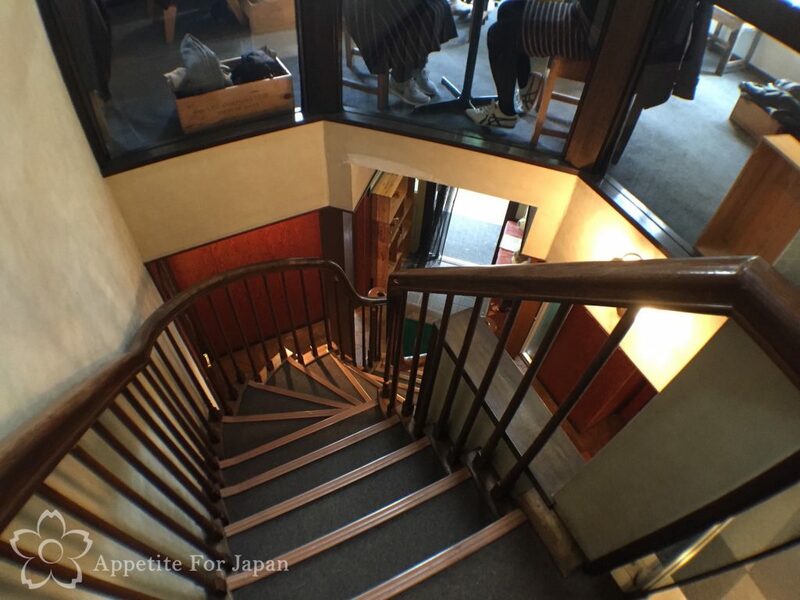 Tolo Cafe is up a very steep and winding staircase. 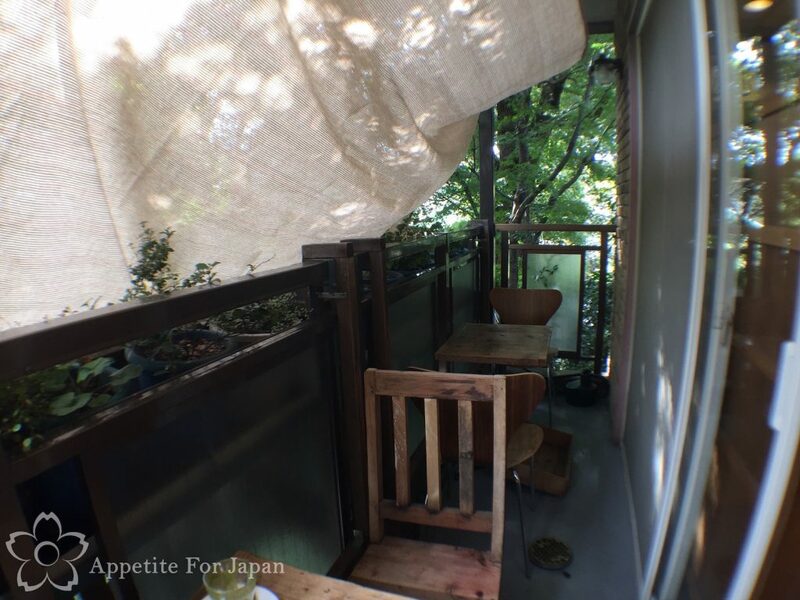 It’s a small cafe, with a few tables inside, and two very small tables (seating up to two people each) on a narrow balcony outside. We were lucky and managed to get a table outdoors, which is usually my preference. 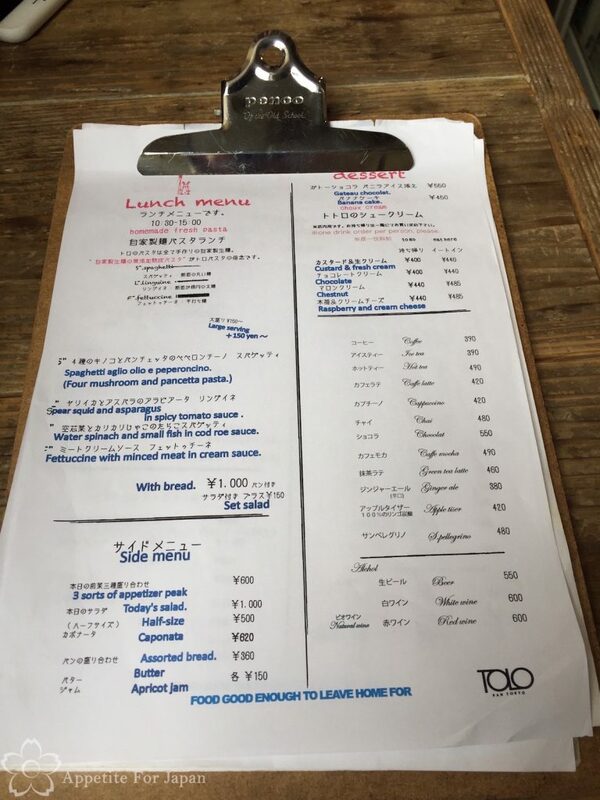 Above: Here is a picture of the Tolo Pan Tokyo English menu. Naturally, we went straight for the Totoro cream puffs on the menu! 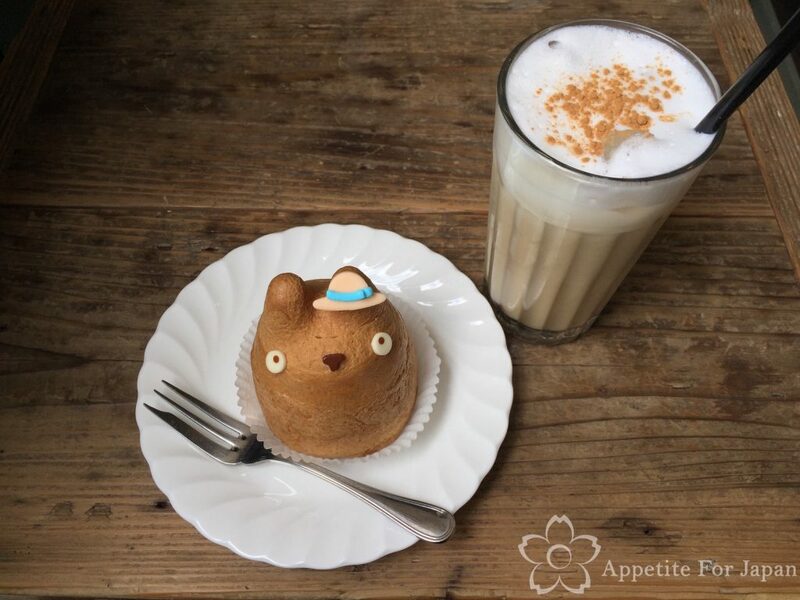 The filling in the Totoro cream puffs varies from season to season. 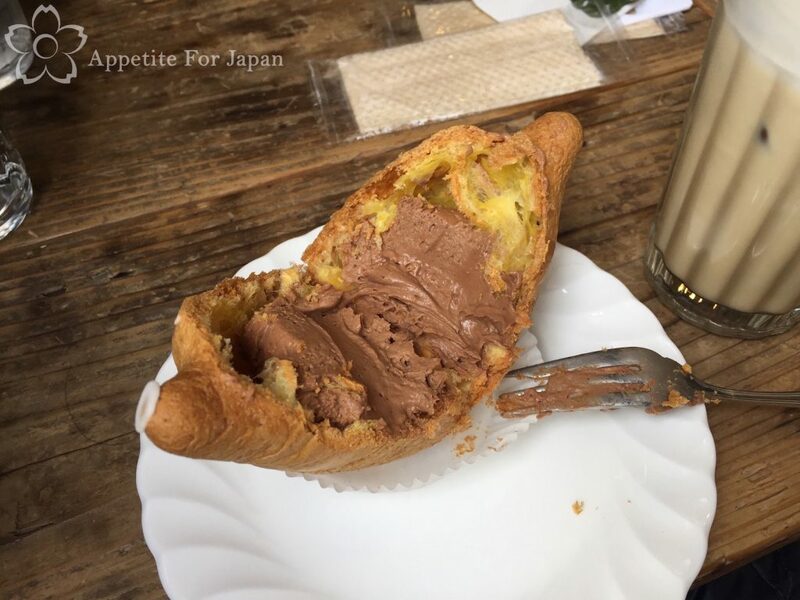 We tried the chocolate and raspberry & cream cheese Totoro cream puffs while we were there, and took a custard & fresh cream one back to our hotel. Shiro-Hige’s Totoro cream puffs are quite large, so one per person is quite enough. Note that the Totoro cream puffs cost more if you eat them in the cafe than if you buy them to take home from the shop downstairs. 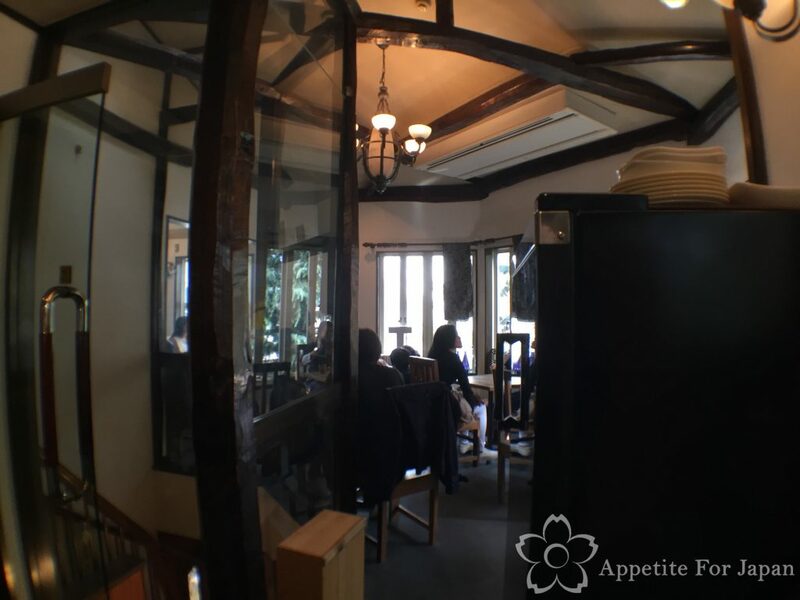 At the Tolo Cafe, you’ll pay 400 to 440 Yen ‘to go’, or 440 to 485 Yen to eat there, with the seasonal flavours being costing a little more than the regular flavours. From what I can tell, if you’re eating at the cafe, then you have to order a drink as well. You can find the full list of regular and seasonal flavours on Shiro-Hige’s Cream Puff Factory website here. 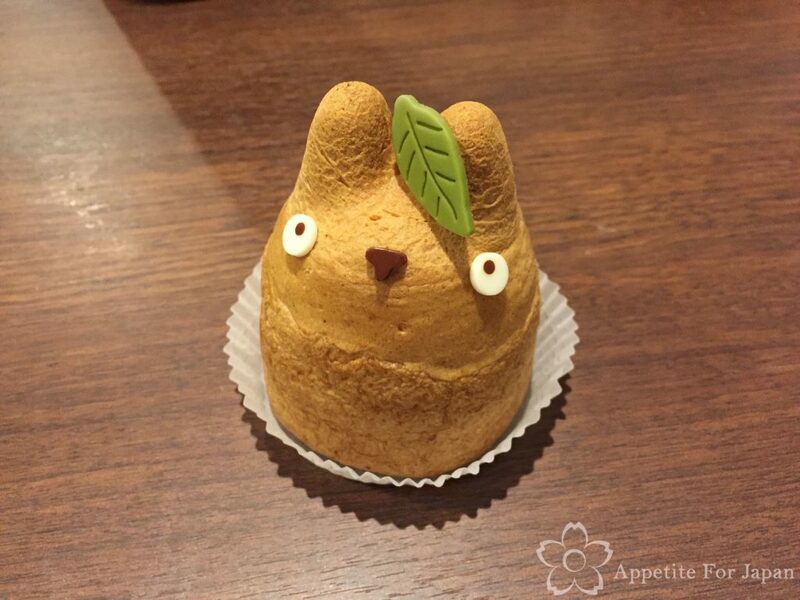 Above: The chocolate Totoro cream puff. Each flavour has a different accessory, such as a little edible hat or a leaf. Above: I ate the chocolate one, along with an iced chai latte which was very nice. 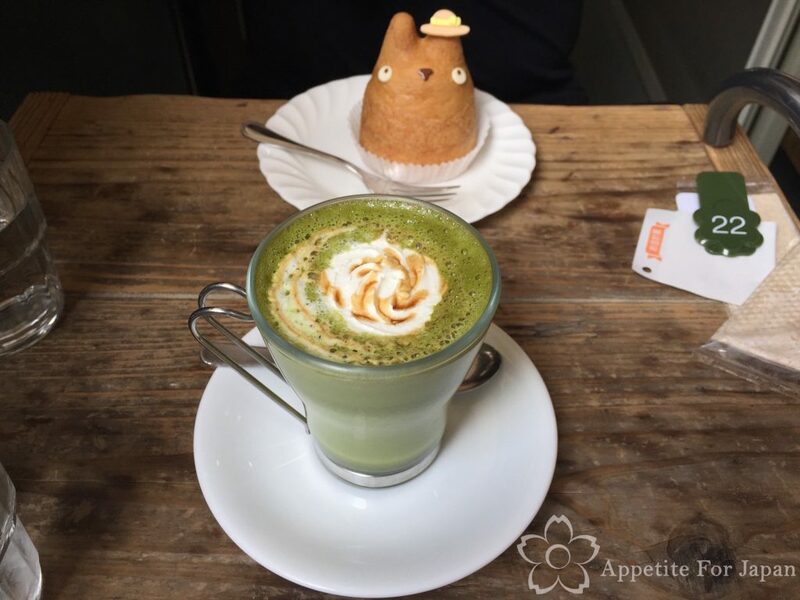 Above: My partner had the raspberry & cream cheese Totoro cream puff along with a hot matcha latte. Above: Here is the custard & fresh cream Totoro cream puff that we took back to the hotel for dessert that night. Above: In case you’re wondering about the anatomy of a Totoro cream putt, here is a photo of the inside of the chocolate Totoro cream puff. Yes, Shiro-Hige’s Totoro cream puffs are essentially profiteroles, and the pastry is fairly crispy. Above: When dining at the cafe, you’ll pay upstairs too. 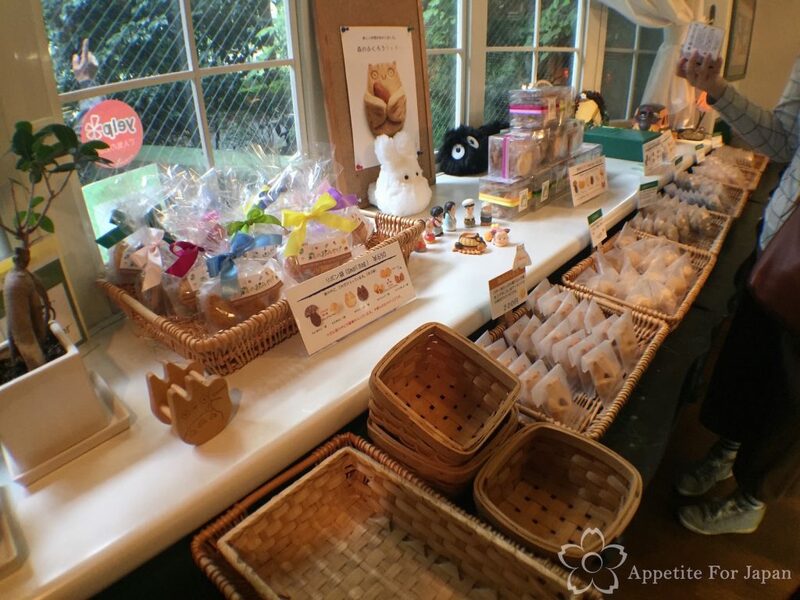 They also have some other breads and pastries that you can purchase up here (not Totoro themed – just normal ones). Above: Once we were suitably full of giant Totoro profiteroles, we made our way down the super steep, winding staircase to Shiro-Hige’s Cream Puff shop. 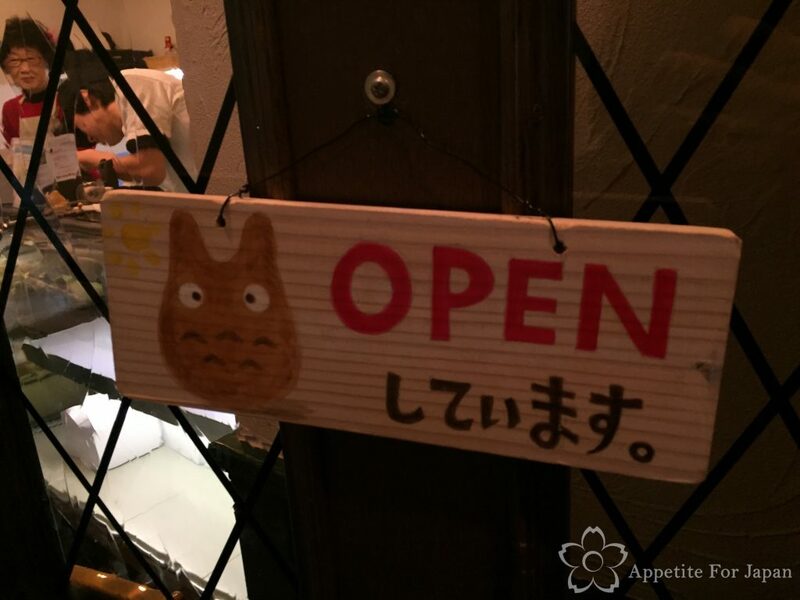 Above: All the signs must feature Totoro, of course! Above: A whole colony of Totoro cream puffs! Super kawaii! 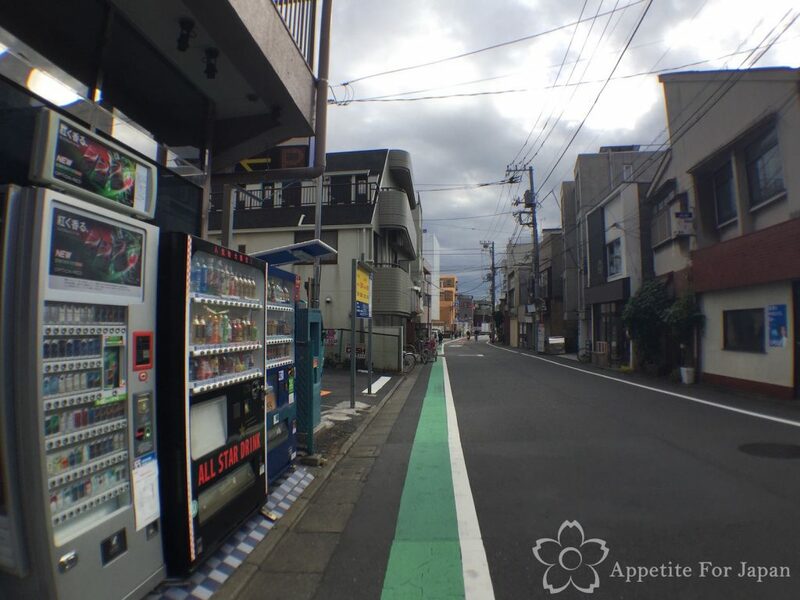 As mentioned earlier, it’s slightly cheaper to buy these take-away (take-out) than to eat in, so if you’re in a hurry, you’ll save a few Yen, too! 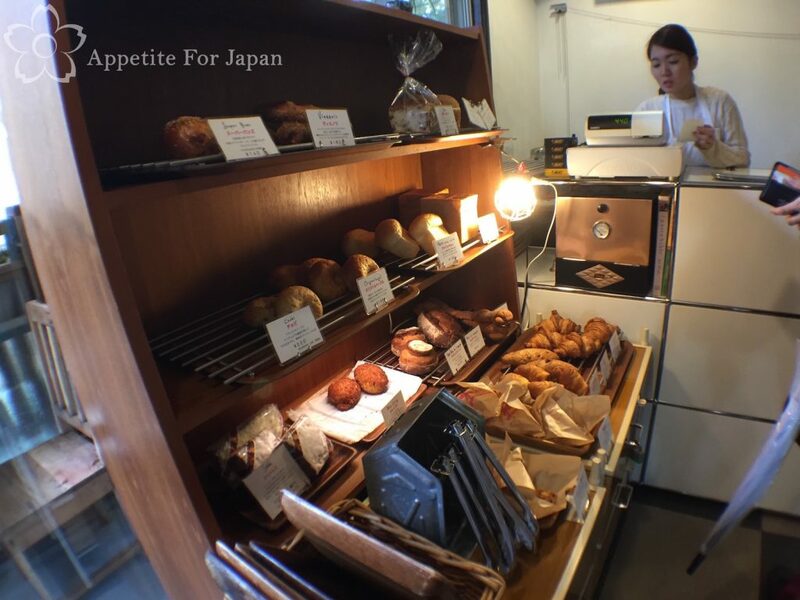 At Shiro-Hige’s Cream Puff Shop, you can buy more than just cream puffs. They also sell biscuits either individually or in small packets. 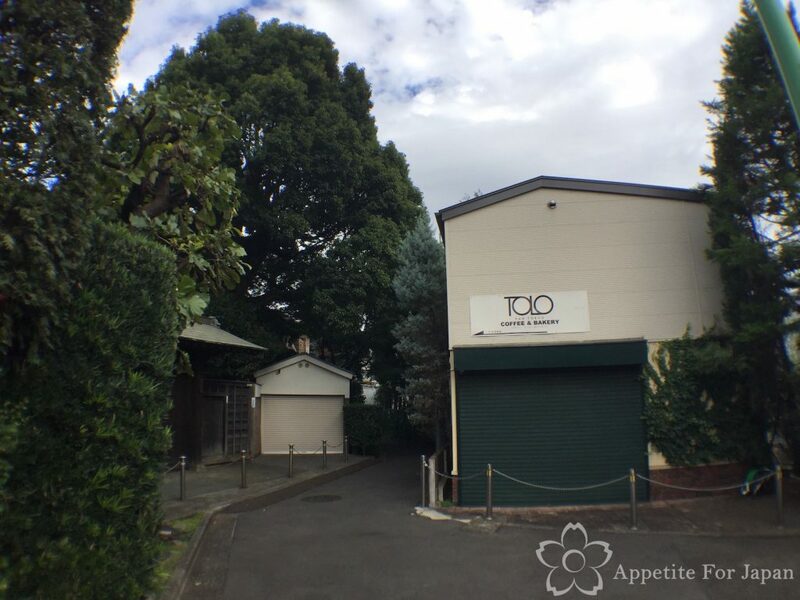 Shiro-Hige’s cookies are all made in the shape of Totoros, or other things that you’ll recognise from My Neighbor Totoro, such as leaf and mushroom shapes. 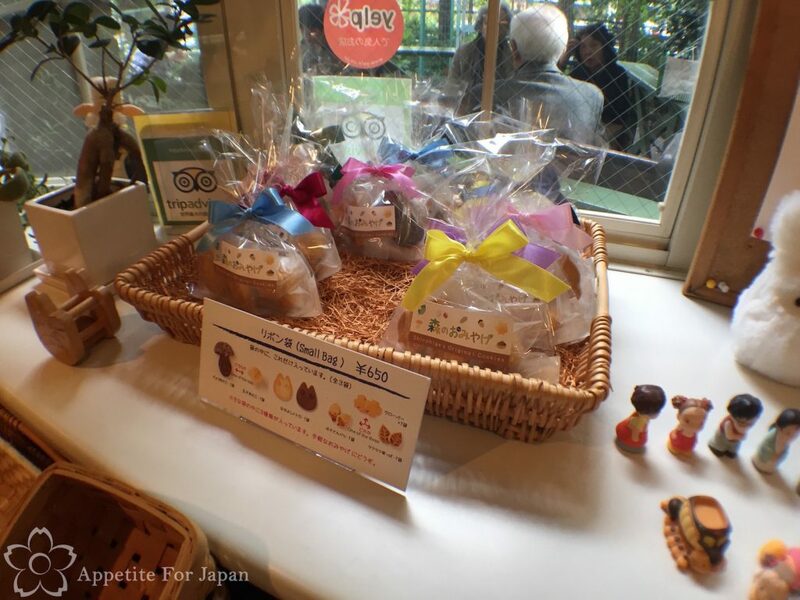 These biscuits are not cheap (a tiny bag with just a few cookies costs 650 Yen), but they’re very cute and were quite nice. 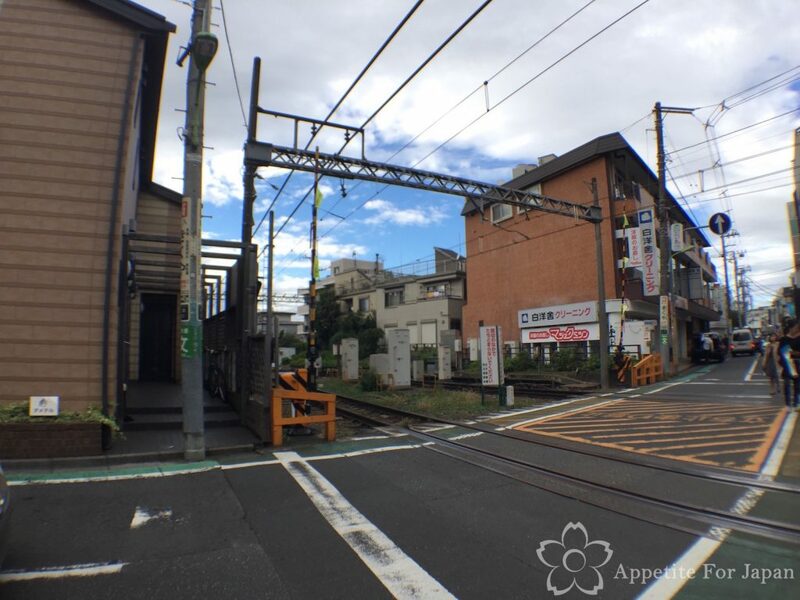 To get to Setagaya Daita Station from Shibuya, catch the Keio Inokashira line from Shibuya and change trains at Shimokitazawa for the Odakyu Odawara line. 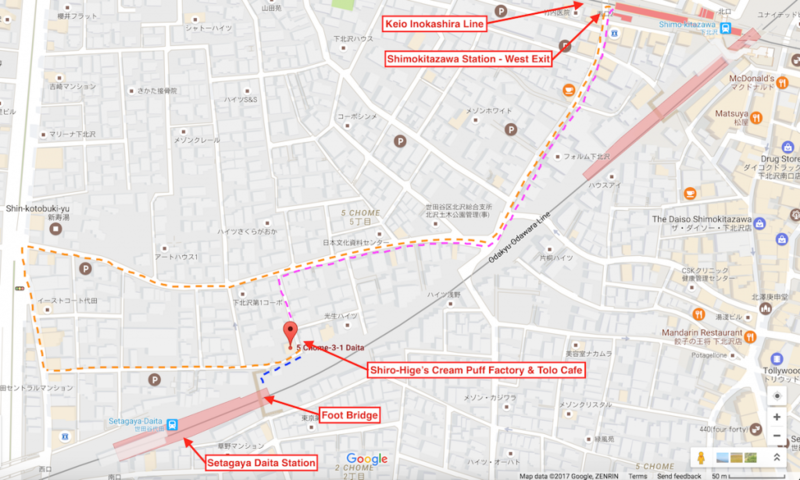 The quickest route from Shimokitazawa Station (shown in pink). I’m including this because I have plenty of photos and instructions, so if you’re not confident with a map alone, you can follow this route visually. Where possible, I suggest taking either route 1 or 2. I had to laugh when I sat down and mapped out the route that we’d walked to get there. Why did we take such a long route? 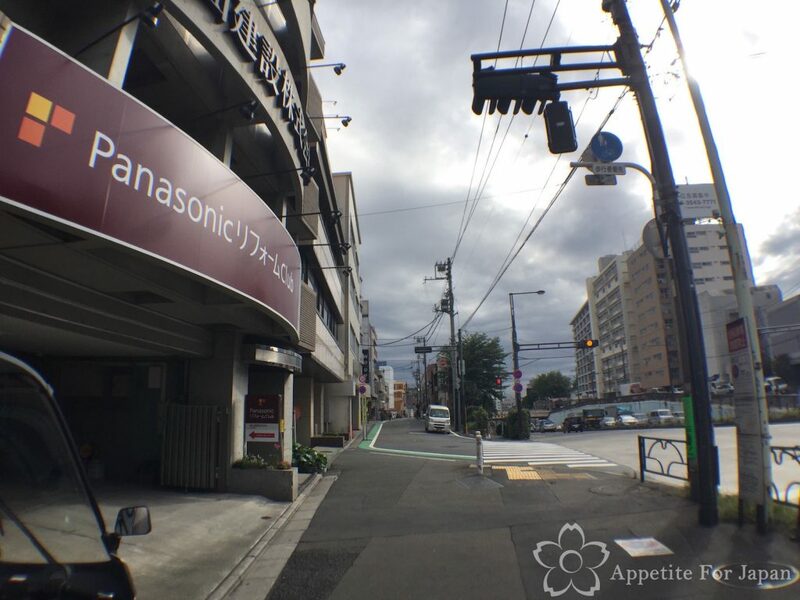 We had read that we needed to go to Shimokitazawa Station, and once we got there we found that the map that we’d printed wasn’t really helpful, so basically we got a bit lost. 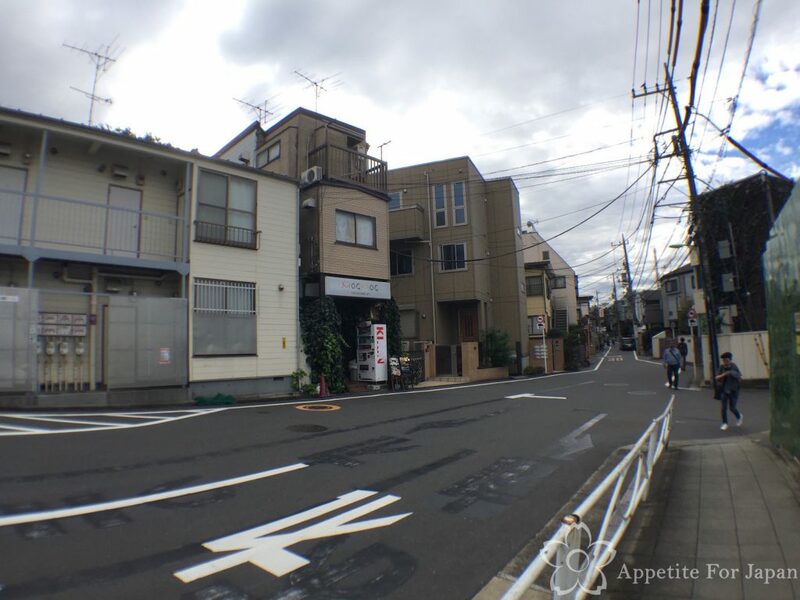 Had we realised that Setagaya Daita Station was closer, we would have taken route 1 instead! 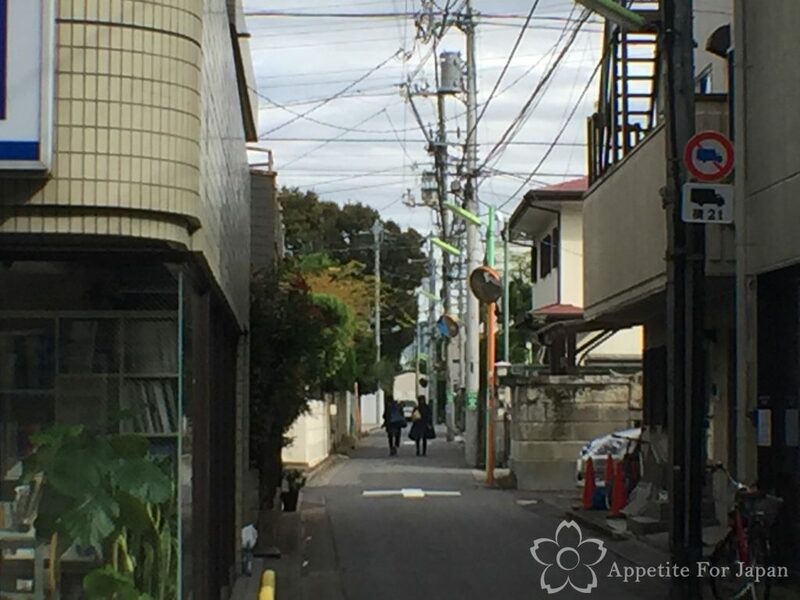 That said, I know that not everyone is confident using a map, and Setagaya isn’t as clearly sign-posted as other areas of Tokyo, so below are my instructions and photos for route 3 in case you want to take this option. Yes, it takes longer, but you’ll get there in the end (and you’ll start to walk off those Totoro cream puffs!). 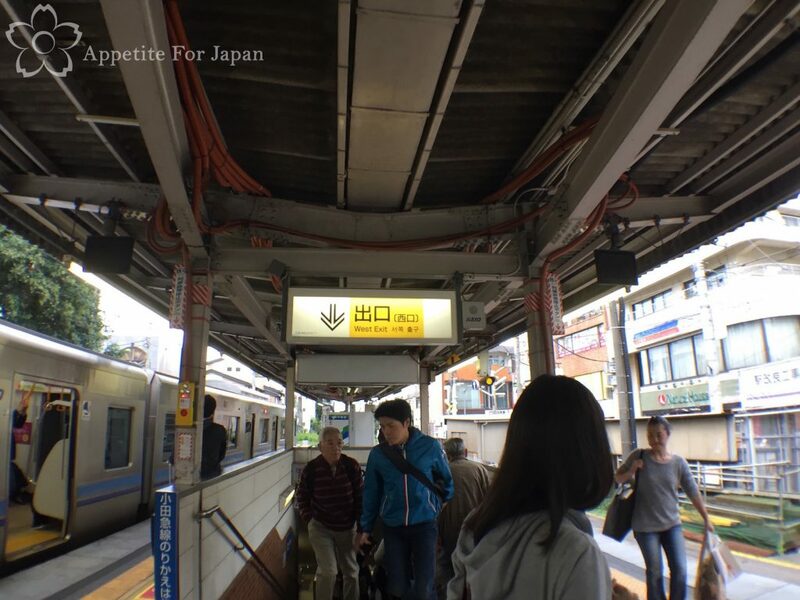 Coming from Shibuya, we caught the Keio Inokashira line (less than 10 minutes) to Shimokitazawa, taking the West Exit out of the station. I’ll reiterate: Make sure you take the West Exit, as this will make things much easier. Above: As you exit the station, you’ll see a level crossing. Do not cross it. Instead, turn left and proceed down the street. 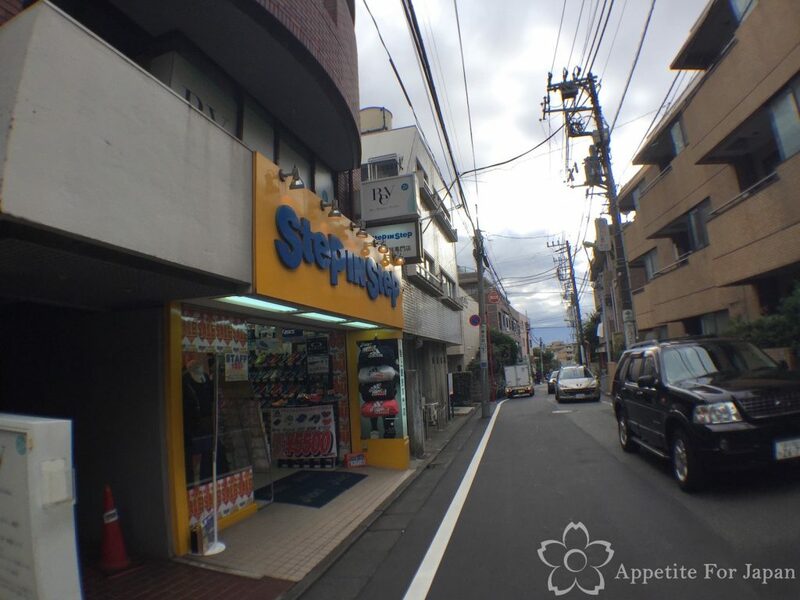 Above: You’ll soon pass the yellow Step In Step shoe shop. Keep walking down this road for a few minutes. 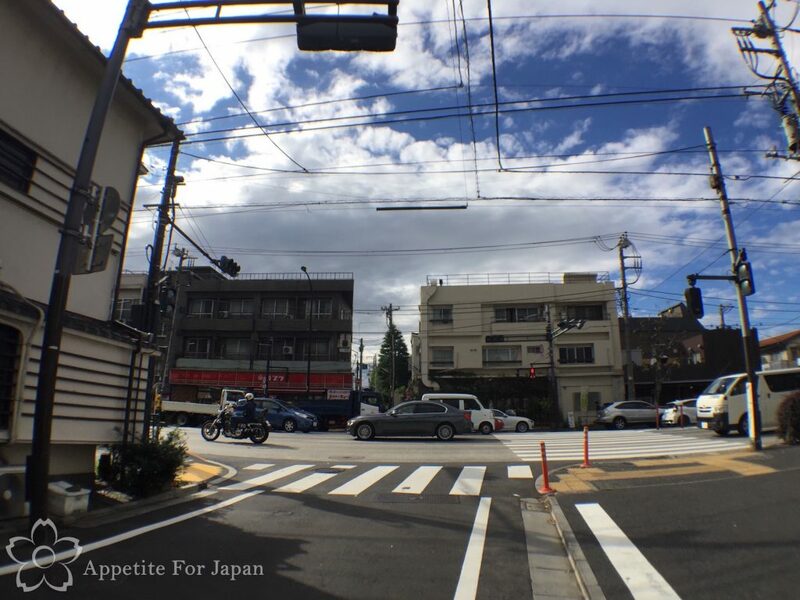 Above: When you see this slight curve in the road and the pedestrian crossings, get ready to turn right at the intersection just ahead. 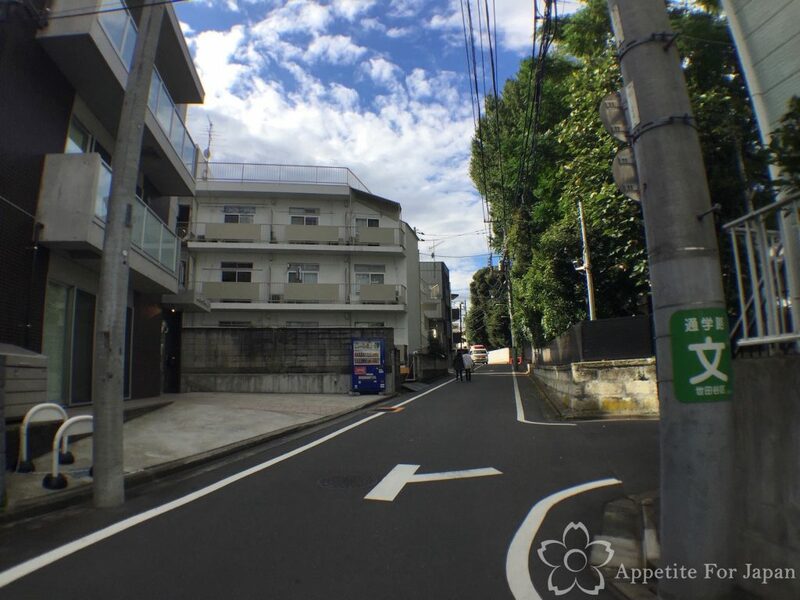 After you turn onto this street you might see the Mog Mog shop on the other side of the road. Keep walking. Above: You’ll also see a the Voice Factory building ahead – keep walking. You’ll be wandering this way for a few minutes. And keep walking in the same direction for a few more minutes. Above: Eventually you’ll get to a main road. Turn left and walk along the main road (do not cross it – you’re already on the correct side – turn left and just walk along it). Above: This is what you’ll see soon after turning onto the main road that I just mentioned. 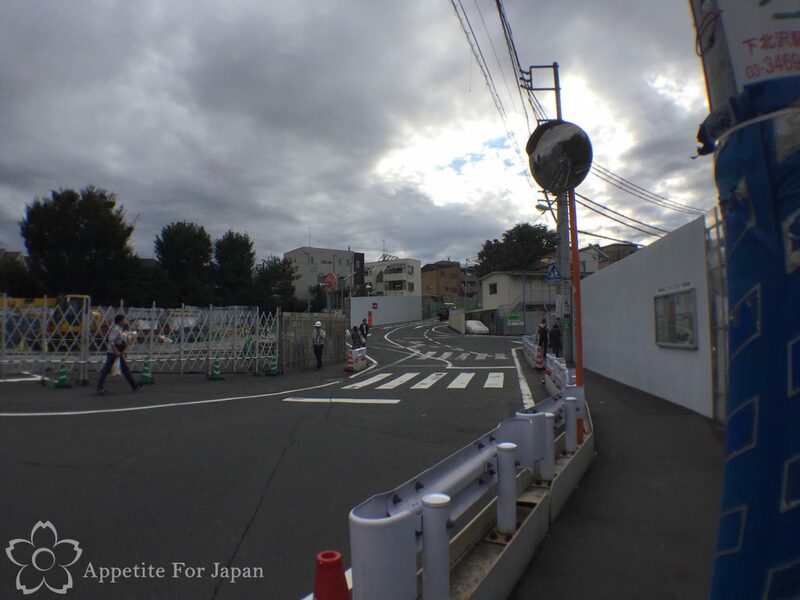 Keep going as the path merges with a quieter street (the main road will still be to the right, but you’re not walking on the main road anymore). Above: As mentioned, you’re now walking down a quieter street. 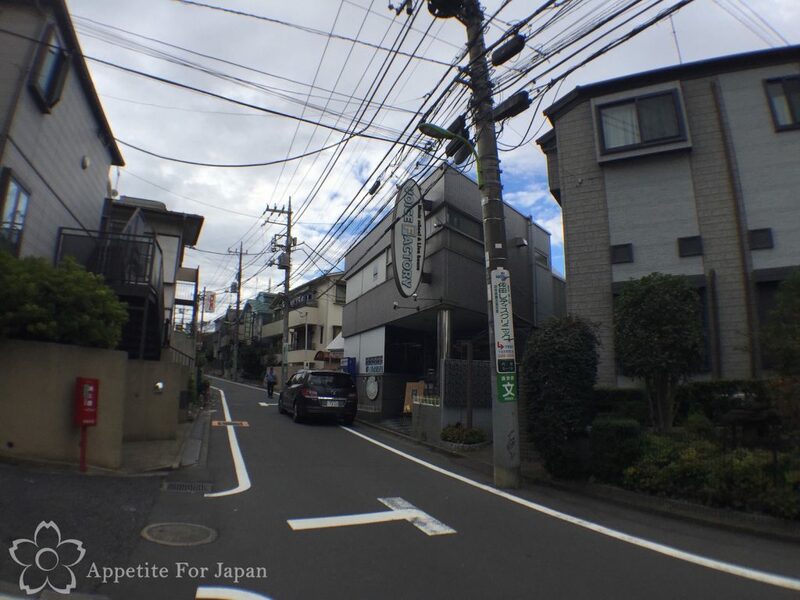 Above: When you get to this small, narrow street (use these buildings as a landmark), turn left and proceed down it. Keep going for a couple of minutes. Above: See that warehouse type building with the green garage door directly at the end of the road (there’s a sign on it that says ‘Tolo’)? Keep heading toward it. Above: The building with the ‘Tolo’ sign indicates that you’re almost there. 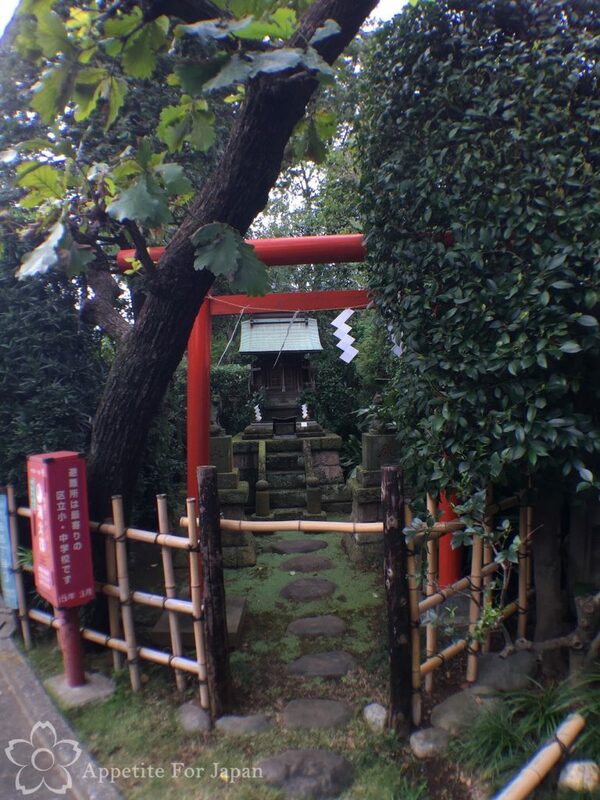 Above: You might notice a little shrine to your left – walk past it and continue all the way to the end of the road. 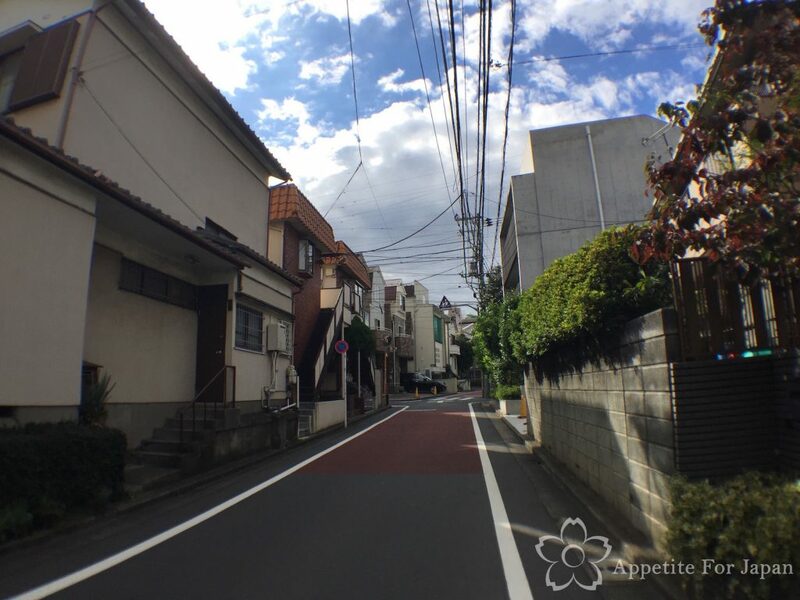 Above: As you get to the end of the road, you’ll walk around the corner and voila! 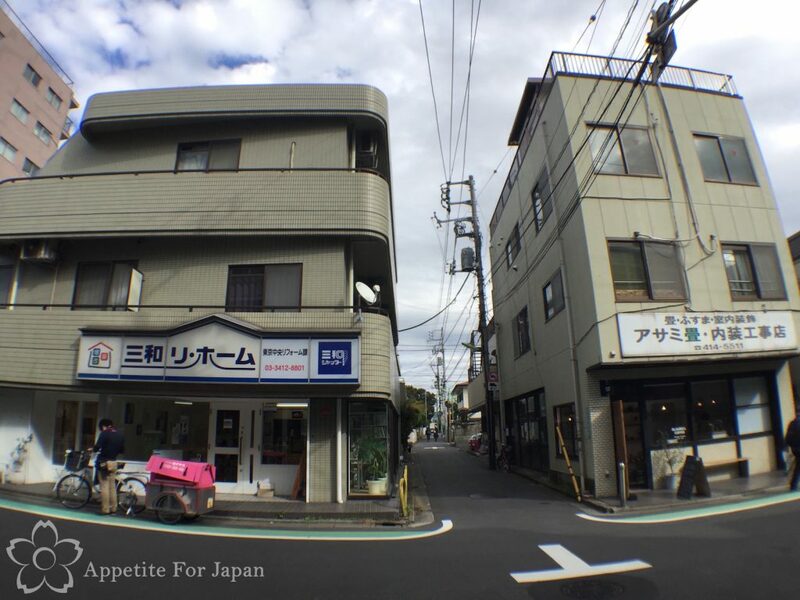 The building housing Shiro-Hige’s Cream Puff Factory and Tolo Coffee & Bakery! Would I recommend Shiro-Hige’s Cream Puff Factory? 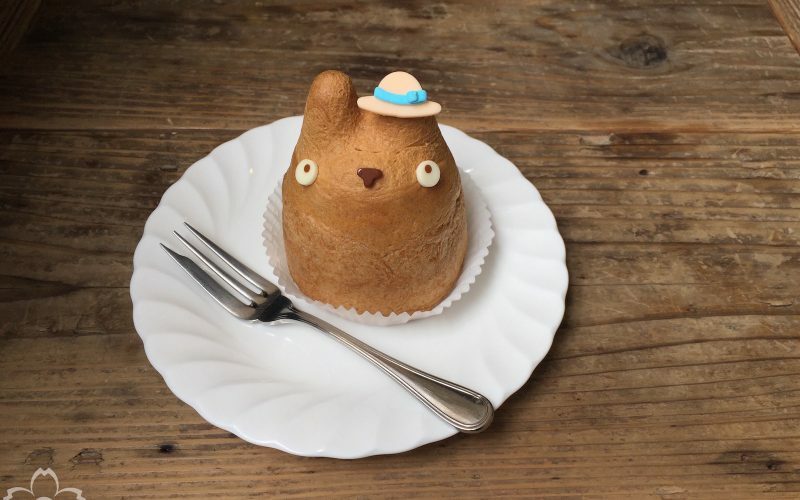 If you’re a Ghibli fan (and especially if you’re a fan of My Neighbor Totoro) and you like profiteroles, then I would definitely recommend stopping by to either pick up a Totoro cream puff from Shiro-Hige’s Cream Puff Shop and/or Tolo Cafe. 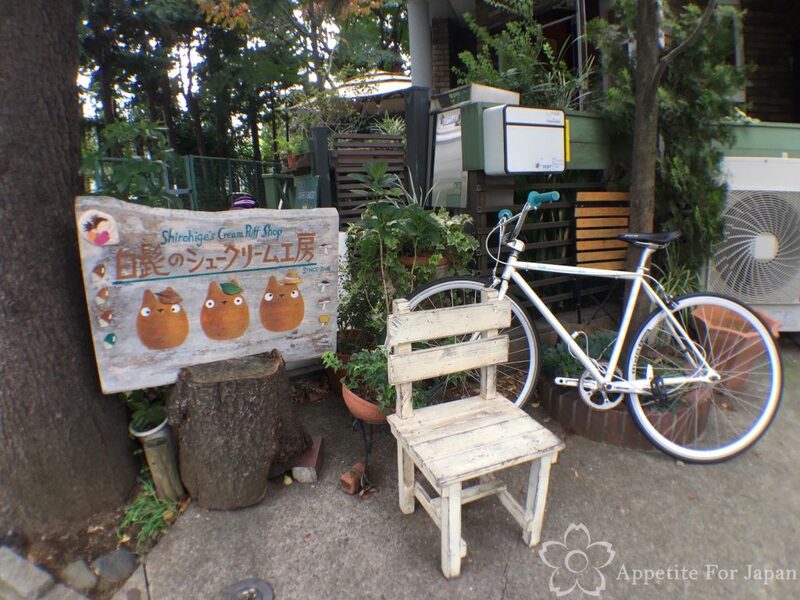 The Totoro cream puffs are really cute, and the cafe has a nice, quiet atmosphere. This is very different to your usual themed cafe. It doesn’t have that commercial, style-over-substance feel, it doesn’t feel gimmicky, the food is both good quality and reasonably priced, and you probably won’t have to queue up for ages to get in. I recommend combining Shiro-Hige’s Cream Puff Factory with a trip to Shimokitazawa, which is an interesting suburb that, despite its proximity to ultra-modern Shibuya, is a lot more laid back and is more popular with hippies and hipsters (lots of second-hand shops) – it’s also home to my favourite Japanese crepe shop, Natural Crepe.